I still had an outfit ready to show you guys. Personally I love how most of these pictures turned out! When shooting outfits with my boyfriend he just knows how to capture me looking at my best. Sometimes I am looking at the photos he made and I am thinking, is this really me?! This look I am sharing with you today is actually the look I was wearing on one of the two days when I went from press agency to press agency for the open days. I actually switched from flats to heels every time at the entrance because heck I would not be able to walk on these pretty sandals the whole day haha. What I really love about this look as that it is pretty simple but still very chic and feminine. The soft pink details in the sunglasses and the jeans make the look pretty cute and the heels, my blouse and the bag gives this look more a chic and feminine touch. A while ago I talked to you about a very cool collaboration I had a meeting about. Since then I shared an outfit with mirrored glasses from MARMA London. 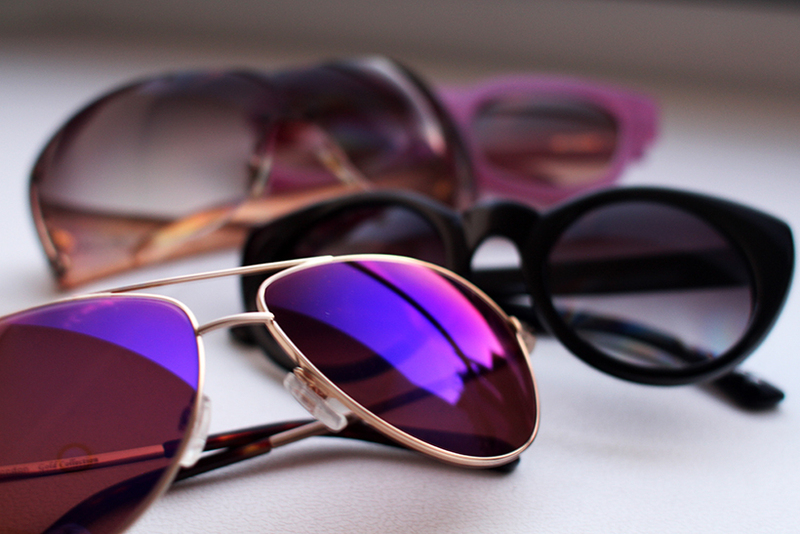 Today I will share another pair of gorgeous sunnies with you which have a pretty cool story! As I told you in this blogpost bckspace eyewear is a pretty special glasses and sunglasses shop and they have some of the most amazing brands. In this blogpost I want to tell you a bit more about these gorgeous pink sunglasses from AM Eyewear…. “Founded in 2003 out of a fanatical love of old school frames that were difficult to find in Australia at the time, AM Eyewear has grown rapidly from a cheeky young upstart into a cult brand respected around the globe. Our ethos is simple; to design beautiful, unique and exceptional eyewear that makes a difference. With so much effort going into the design and manufacture of every frame, we choose to dedicate every design to the person who has inspired it. The sunglasses fit really well as the ‘legs’ are adjustable to your head and ears which is great. Wearing and holding the sunglasses you noticed the quality and craftmanship very good. Although the glasses are pretty light (definitely not heavy if you ask me), the frame and glasses feel very strong and unbreakable. The ZEISS lenses are perfect as well, thanks to the gradient you can see in the lenses the light gets blocked in a nice, warm way. Other very cool things about AM Eyewear is the case delivered with the sunglasses, which is totally beautiful! Besides that the lens cloth is very pretty as well, in the fabric there is a long story about how AM Eyewear started.